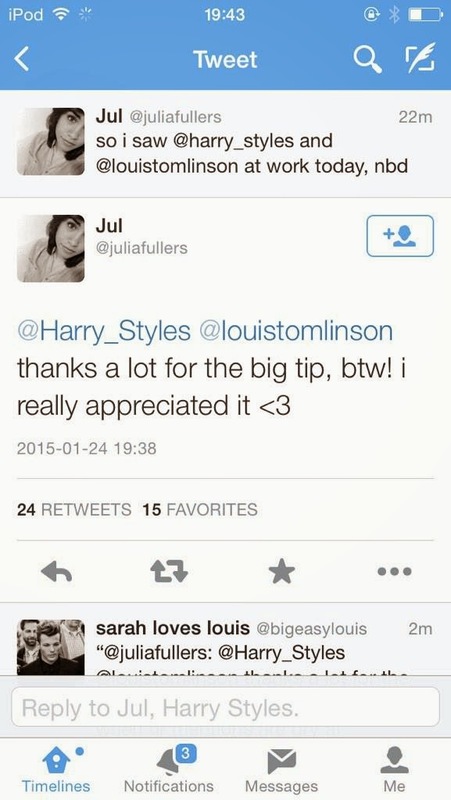 The girl who says that Harry and Louis is at the dinner place she's at, is allegedly still there waiting she says. ..Unless of course they left through the back door which would make sense if they were actually there (especially considering the rumors on twitter and tumblr). You might have noticed that the "waitress" doesn't tag louis' actual account, which is weird, but maybe because she isn't -at least not openly, judging from her profile- a 1D fan. this is atm completely unlikely to be true i think. Update: The waitress is answering A LOT of questions, and is now claiming Jeff Azoff and Eleanor was there with them (check the link for her profile, there's really too many questions and answers to post here). She said after people asked, that there were 4 people. When fans showed her pictures of jeff, she said that that was the guy. Then she confirmed that Eleanor was the girl in the same way - a fan showed her a picture. She also answered that Harry and Louis were sitting next to each other and not beside the "tall brunette". In the meantime, the girl who started the whole thing is claiming to have left now. Update 2: I believe the "Waitress" just admitted she lied, starting off by tweeting "I mean... do i deserve an emmy or what? ", changing her name and then tweeting "that's to show you how easy it is to fake things on the internet! Don't believe in everything you read, have a nice day xox". HAHA, i kind of love this girl. Seriously, that is hilarious. The girl who originally said that Harry and Louis were having dinner together is still claiming she's speaking the truth.